This was…July 8, a little before 6:00 pm. I actually first saw the hawk soaring right above Perry Street when I came out walking Millie (of course) with a Peregrine Falcon even higher in the air. Both were great sightings for the West Village—I haven’t seen a Peregrine over the neighborhood in about a year, and not a Red-tail since January. For a while in the winter there was a pair of Red-tails that seemed like they might be real-estate shopping, but then they disappeared. (Probably to New Jersey!) So these two flyovers were notable in themselves. 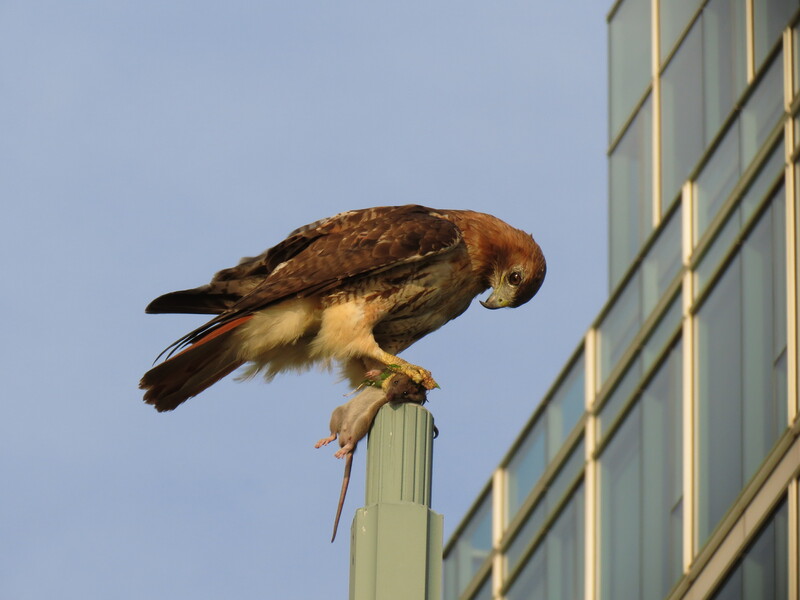 When we got to Hudson River Park, entering at Charles Street, I noticed the hawk perched on the corner of one of the Meier buildings, got a few photos (cool), then the hawk plunged down out of sight. Almost immediately it swooped back up right into the park and alighted on a lamp post right by (the newly reopened) Pier 46 with its catch. It wasn’t completely clear whether the rat was already dead, because there was some reorganization of it. The hawk stayed for several minutes, giving me time to race around for some better close-ups, and time for it to gather quite a crowd. One animal killing another is alarmingly visceral, even if the killee is a rat which is not high on anyone’s cute and cuddly list. Still. There was a lot of vocal narration—step by step, flap by flap—by the rubberneckers, including one loudly screaming child (which I’m not sure was connected to the carnage, but it certainly contributed to the atmosphere). 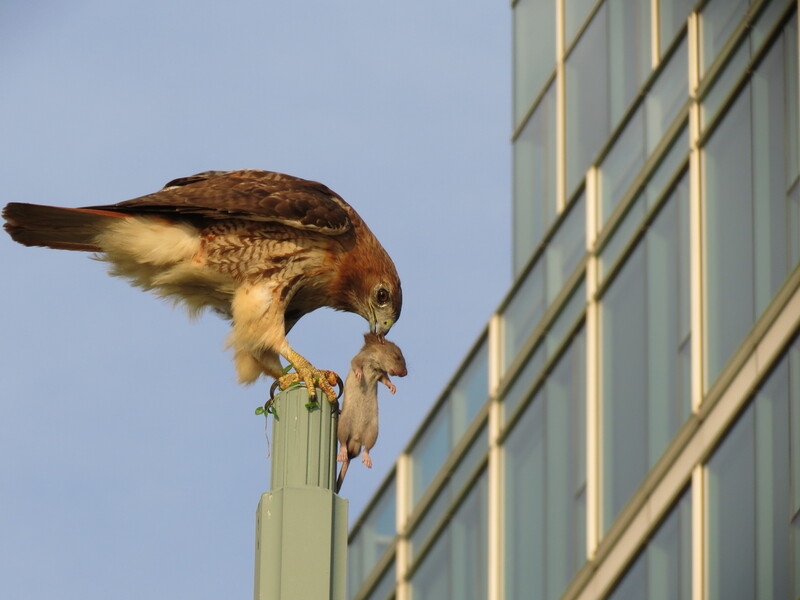 Finally, the hawk, a handsome adult, flew off for dinner. Quite an evening event. The beauty of Keith Michael’s work is how it helps open our eyes to the presence of nature in the city — always there for all of us to see, if we look for it. To inspire us to pay more attention, Michael has now collected some of his favorite photographs and stories into a book, Once Around the Block: A Birder’s Year in the West Village, featuring accounts of more than a year’s worth of monthly walks with Millie and illustrated with 230 color photographs. Urban nature-lovers who’d like to accompany him on a walk with their own camera in hand can do that, too, by signing up for one of his guided outings. • Preview and purchase Once Around the Block. 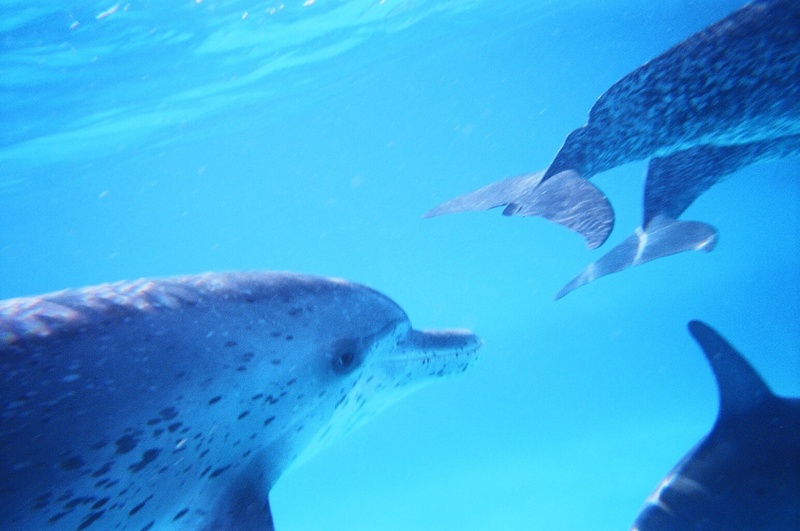 • See more of Keith Michael’s photographs. • Learn more about Keith Michael and sign up for a Nature Walk. 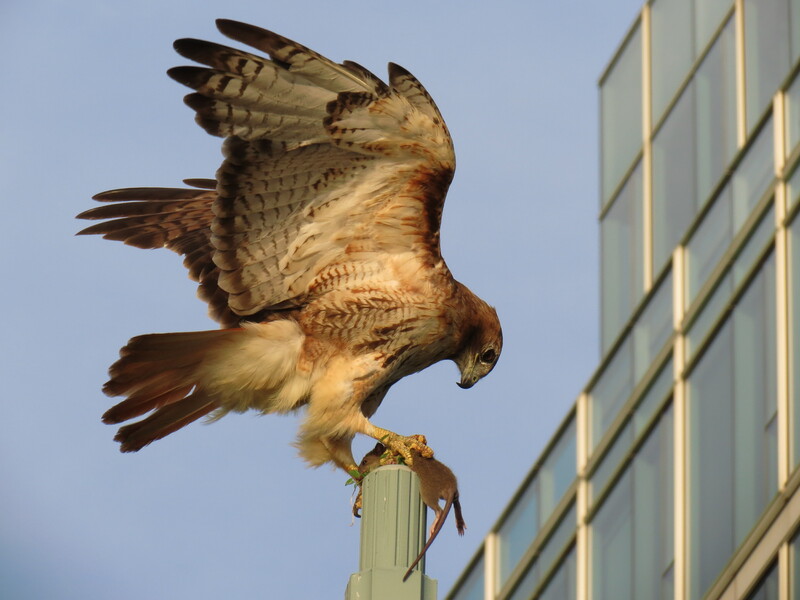 This entry was posted in Nature in the City, Photography & Images and tagged Hudson River Park, Keith Michael, Once Around the Block, Red-tailed Hawk. Bookmark the permalink.